There are few events in Durango planned more to the nth degree than St. Columba School’s annual gala, which is the school’s major fundraiser of the year. Before I look at any auction items at this event, I always just stroll around and check out the decorations, because they pick a theme and make it outstandingly over the top. And that’s not Butler hyperbole. This year, the organizers transported guests to Morocco in the Moonlight from the entry hall to the classrooms and gym. The attention to detail and sheer variety of decorations are worthy of oohs and aahs. Or, as Katie Stewart, the auction and gala coordinator put it, they “transformed the school into a captivating Saharan soirée.” Kudos go to the Decorations Committee, Mariah May-Ostendorp, Mary Lynn Clark, Jenni Ziercher, Tobia Green, Lyn O’Brien, Elesha Kinn, Jeanne Moore, Linda Long and Libby Russell. The classrooms and the hallway held a cornucopia of silent auction items, and as always, the classroom baskets were among the big-ticket items. These are so much fun – each class picks a theme, such as the fourth grade’s Mediterranean Wine Cellar, which came with a stocked mini-wine refrigerator, and the eighth grade’s Shaken, Not Stirred, with all the ingredients for happy hour, including a bar cart, glasses for different cocktails, mixers and the alcohol to finish it off. The auction is without a doubt one of the most varied and extensive – about 160 items – at any fundraiser in town. So here’s a shout-out to Lisa Noyes, who directed the Silent Auction Committee along with her able volunteers Stephanie Pace, Lee Ann Harbison, Tami Huber, Sandy Gurule and Adrienne Aronson. Dan McVeigh, who has taken on the bar stocking and management for several years, Tracy Pope, who chaired the parent committee for several years, and Kathrene Frautschy, who helped run the 23-year-old event for many years as the school’s development director, all deserve special thanks. All told, more than 70 people helped pull off the event. The Rev. Kevin Novack of St. Columba Parish has found a gracious way to remind guests every year that the event is to support a beloved school, and they should open their pocketbooks. In this year of fearmongering, having a Catholic priest kick off a gathering with “salaam aleikum,” “peace be with you,” in a bow to the theme and a quote from the Book of Sirach (in the Catholic Bible) about generosity was a heartwarming start to dinner and the live auction. Parents supplied a number of appetizers, and Gina Pastor, whose day job is feeding St. Columba students, catered the dinner. The menu included Moroccan carrot and chickpea salad with currants, toasted almonds and a lemon, orange and honey dressing; grilled Moroccan chicken served with basmati rice pilaf and roasted vegetables; and M’hanncha, a phyllo pastry dessert with almond filling, scented with orange blossom water and topped with an orange and honey syrup. Bill Gwinn once again served as master of ceremonies, although he ditched his tuxedo for a, well, I guess you’d say genie-in-a-bottle outfit. E.M. Taylor and Lonnie and Dena Malouff from Classic Auction returned for the 18th year of handling the live auction, and in recent years, they’ve been joined by the next generation, Brady and Michelina Paulek. All told, the 210 attendees grossed more than $68,000, which will be used for quality sound and lighting for the school’s performing arts program along with the school’s continuing improvement of technology, support services and reading instruction. 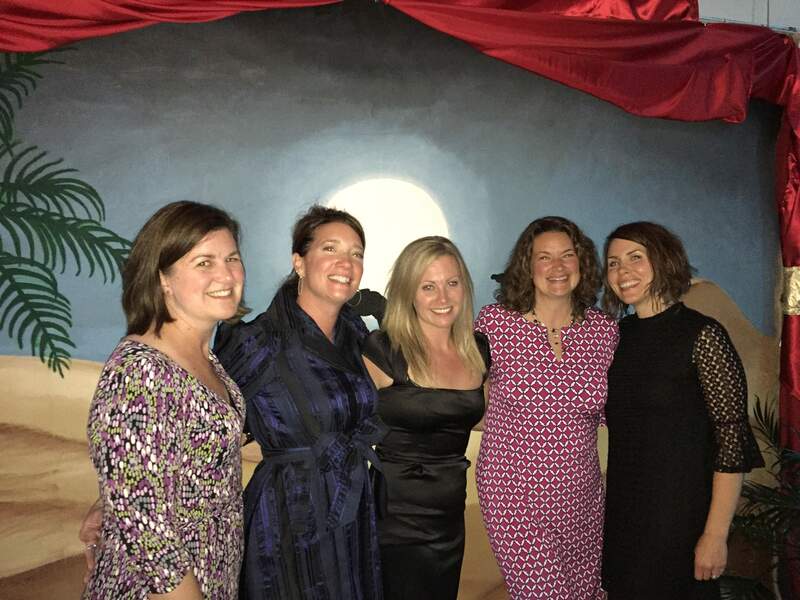 Members of the Decorations Committee for the St. Columba School Gala with the theme Morocco in the Moonlight, from left, Jeanne Moore, Elesha Kinn, Libby Russell, Mary Lynn Clark and Jenni Ziercher, celebrate a job well done. The event grossed more than $68,000.